Just a couple of weeks ago, A Sunday In fact was the day I got up early and caught a train to London to meet one of my closest friends from the Blogging world here in the UK Vicki - Insert Vicki's YouTube Channel. 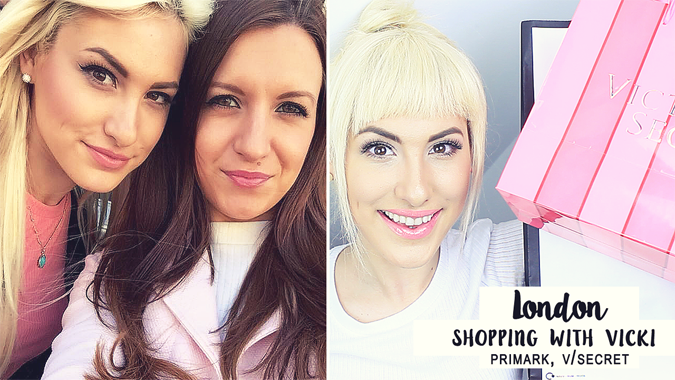 We travel in pairs to many events and since we don't live as close to each other as we hoped, we have to come up with a place to meet and this time we chose Central London for some Shopping. We swapped late Christmas gifts (I know, LATE!) and had a lovely lunch and spent more than 2 Full hours in Victoria Secret just swooning over each and every garment inside. We have very similar tastes so imagine us afterwards in the Gym section in Primark - Yes, we could of spent ages looking through all the gym clothes. Here is a snippet video of what I bought but also make sure you click on the link in the down bar in the description of the video to check out Vicki's Haul! Be aware as there are some very funny expressions that Vicki so kindly pointed out and I could not stop laughing! What's your favourite store on Oxford Street?